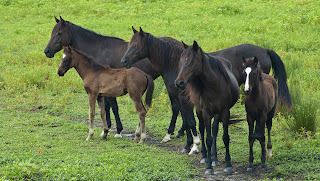 Payne's Prairie is home to a small herd of wild horses. They are thought to be descendants of horses brought to Florida by Ponce de Leon in 1521 that have bred with horses from many other sources. These Florida Cracker Horses are tough and live in an environment that constantly changes due to water levels and that is heavily populated by some very large alligators. We hiked the La Chua trail this morning and found three small bands of these horses near the observation tower along with a lone stallion that was somewhat protective of the band shown in the photo. I've seen the horses on the prairie several times but never this close. The area they were in is usually covered in water even during the dry season but is now covered in lush vegetation.